Now that we were getting close to Thanksgiving, crews were getting their boats settled and thinking about home. At 6:30 AM, we drove Berrlin and Debra to the Pensacola airport for their flight to Denver. Because we originally thought we were taking the boat to Dog River Marina, we had to drive there to pick up delivered mail. While there, Tom looked around the yard, talked with their maintenance people, and made the final decision to have our work done there. Tom and Glenda Smitherman from Genesis (who had returned to Demopolis 5 days earlier) had asked if they could come visit and take us out for lunch. We looked forward to seeing them again and talk about “their story.” We were humbled when we learned they drove 249 miles just to see us! They had made reservations at their favorite restaurant in town, a restaurant at which they celebrated every anniversary…Felix’s! Though Glenda felt bad we had been there just the night before, we thought it was great!!! (Paula had told Tom V. when we left the night before she would really like to eat there again. With great food, great service, great views – why not?) 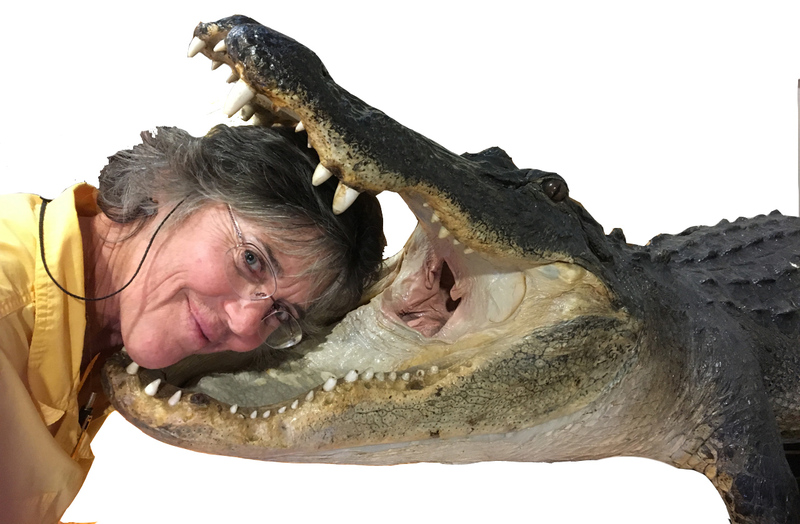 We had sweet fellowship over lunch with them and then went to Five Rivers Park and visited the nice resource center, where Paula had a close encounter with an alligator (fortunately…not a real one). 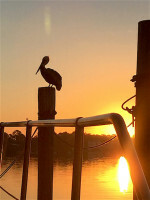 There in the Mobile-Tensaw Delta, the Mobile, Spanish, Tensaw, Avalanche and Blakeley Rivers all come together. Too soon, it was time for them to drive home. 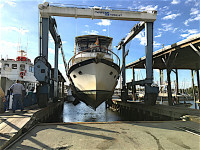 But the great news of the day was their boat repairs were not as extensive as first thought and they hoped to start out again as soon as it was fixed! Thanks, Tom and Glenda for your special friendship. Back at the boat, Tom V. helped Tom H. with some boat balancing, moving lead bars around. That evening, Tom and Paula came over for one last visit before they drove home to Murphy, NC for Thanksgiving. Tom H. commented they had spent more time with us the last week than any other couple they could ever remember. We had enjoyed every minute of it and were going to miss them. At 5:30 the next morning, Paula took Tom to the Mobile airport for an evening meeting in San Antonio, but alas, it was not to be. Flying standby, he only got as far as Charlotte, followed by a return to Pensacola to be picked up late afternoon. 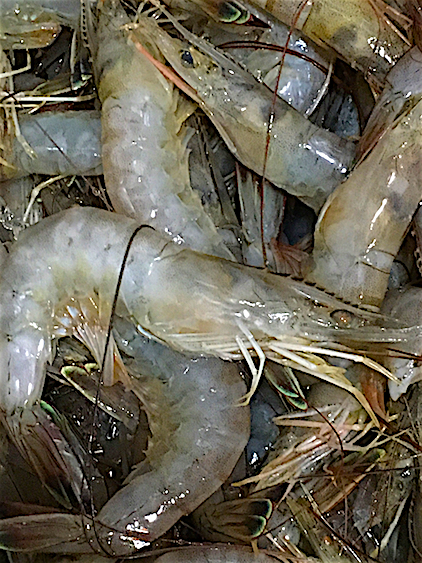 Meanwhile, Paula visited with old and new friends around the marina, bought 5 pounds of fresh shrimp right off a shrimp boat (only $3 per pound), grimacing as she removed their heads, a first for her. (Watch the cleaning process here.) Sautéed shrimp that night was delicious. Paula found out Eastern Shore was going to put on a pre-Thanksgiving dinner on Saturday. 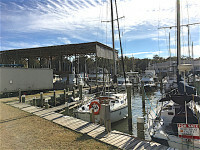 That was enough to make us stay there rather than move to Dog River Marina on Friday, not knowing yet when they could haul Life’s TraVails out of the water for inspection. By evening’s end, our refrigerators were chock-a-block full, as happy recipients of all those friends leaving the marina. Thursday we drove to Mobile to sightsee. On the way, we stopped in Daphne at the American Sport Art Museum & Archives (ASAMA), not sure of what it was. We were so glad we did and delightfully rewarded. 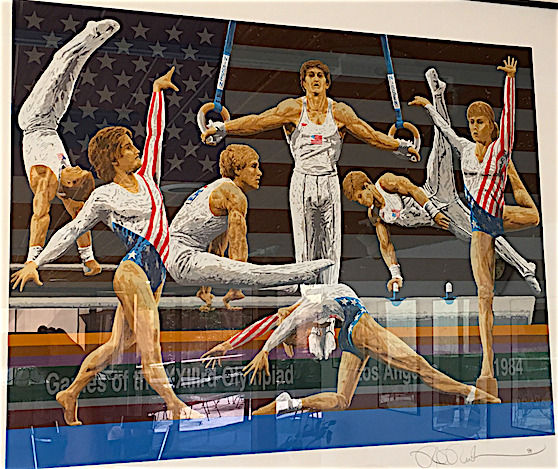 The ASAMA was dedicated to the preservation of sports history, art, and literature and contained an impressive collection of sports artwork. 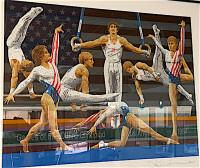 The associated US Sports Academy was a sports university with programs in instruction, research and service to prepare individuals for careers in the profession of sports. 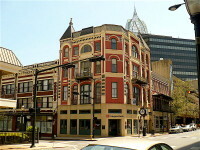 Pincus Building on Dauphin St. In Mobile, we first went to the Fort Conde Welcome Center to pick up maps and ideas for our day. Mobile was established in 1702 by the French and in 1711 moved to its present location where the Mobile River and Mobile Bay meet. 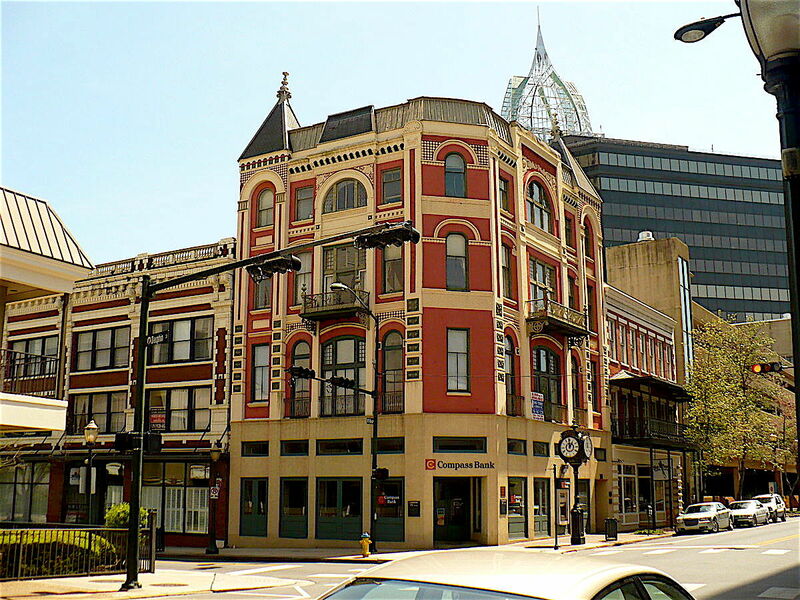 Though fire destroyed the older wooden buildings downtown, the buildings which replaced them were built in the Federal, Italianate, and Victorian-style architecture. 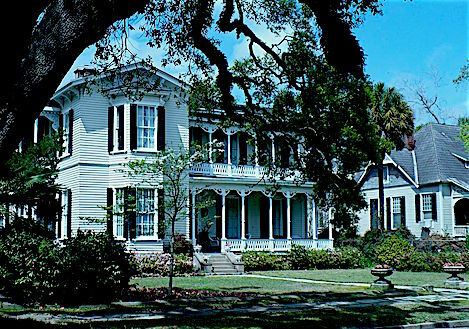 We enjoyed our walk in the nearby Dauphin Street Historic District. Passing a church with large stained glass windows, a door opened and we asked if we could come in to see the windows from inside. We were cordially invited in, and a young gal offered to walk us upstairs for a tour. We learned the church was originally St. Francis Street Methodist Church, built in 1895, one of the largest and most dynamic churches in Mobile for over 100 years. Unfortunately, the church closed its door, sat empty for 10 years, and faced demolition. Enter Clif and Ginna Inge. 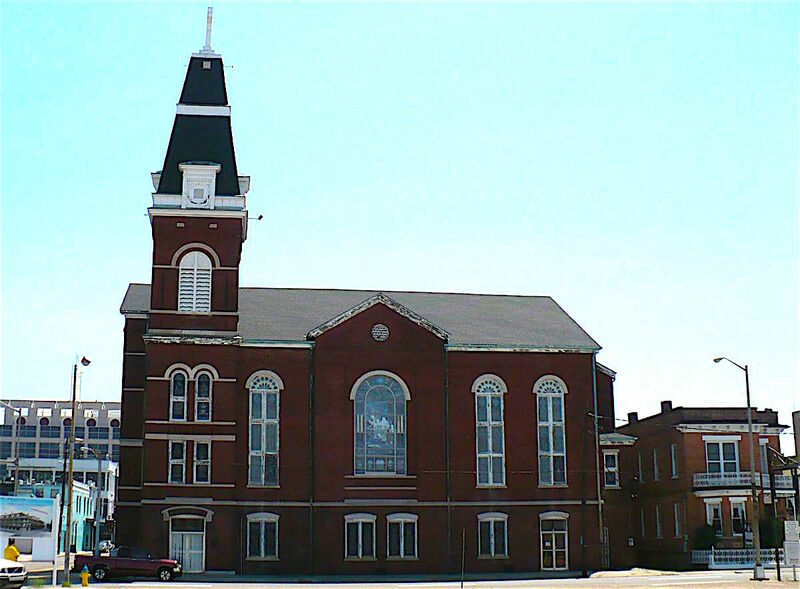 They bought the church, and after 2 years of restoration, renamed it The Steeple and opened it for events, one of which was a “mystery concert” the next night. 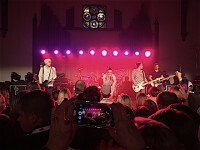 They had sold 650 tickets while keeping the headliner a secret, only saying the band had been nominated for and won several country music awards, including a Grammy nomination! We got to talk with Ginna, and learned she had, in her younger years, been a rafting guide on the Snake River and she got all excited about Canyon Ministries and our trips in the Grand Canyon. Before we knew it, we had a promise she’d find tickets for us to come to the concert. We were blessed. On Friday, Paula did some running around, getting her hair trimmed and buying some supplies while Tom worked on the boat. At 5:30, we left for the “mystery concert” at The Steeple. 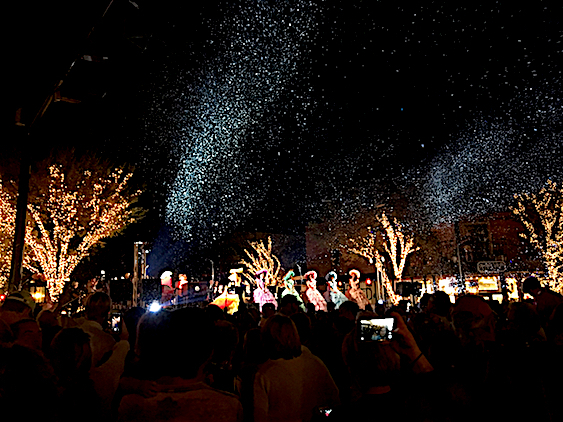 After Markus Fox opened, it was revealed the mystery band was Band Perry, 2 brothers and a sister who grew up right in Mobile. It was a high-energy show. 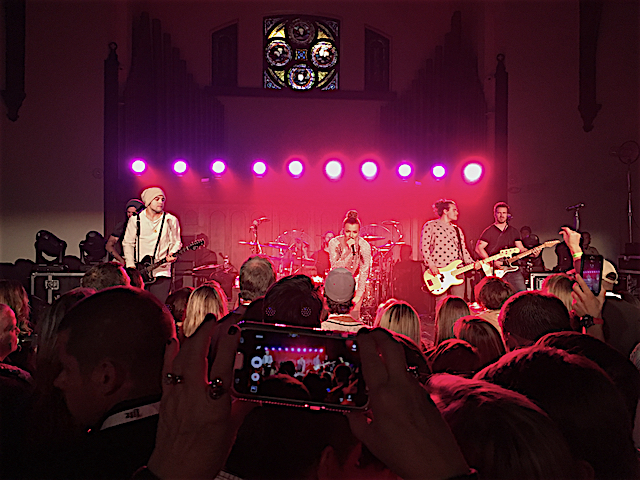 Kimberly’s great voice really shone as she and her brothers performed the band’s hits. Mobile could be proud of their accomplishments! After hours of standing on our feet packed in the crowd, we happily gave each other foot massages before falling asleep. We awoke in the morning to a rocking boat. Tom thought it was the shrimp boats returning, but after 15 minutes of unsuccessfully trying to go back to sleep, Paula told Tom there weren’t that many shrimp boats! Actually, the wind was up and sailboat masts were coming very close to each other as they jigged and jogged. We checked our friends’ boats and re-tied Tango Papa (watch her rocking here) and Satisfied Frog to center them more securely in their slips. This was as hard as we had ever rocked inside a marina. There were actually boaters standing on the docks because their boats were too uncomfortable to stay aboard. 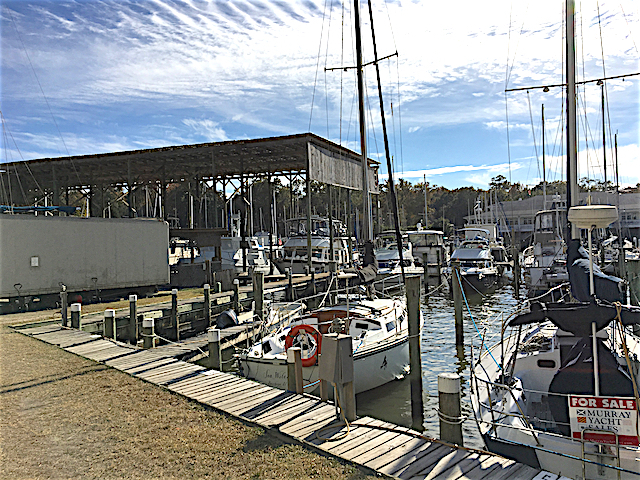 That afternoon, Eastern Shore Marina had its pre-Thanksgiving dinner. They supplied the turkeys (cooked in 2.5 hours by infrared ”dry frying” method), crockpot stuffing, sweet potatoes, and rolls; marina guests came with loads of delicious appetizers, sides, and desserts. 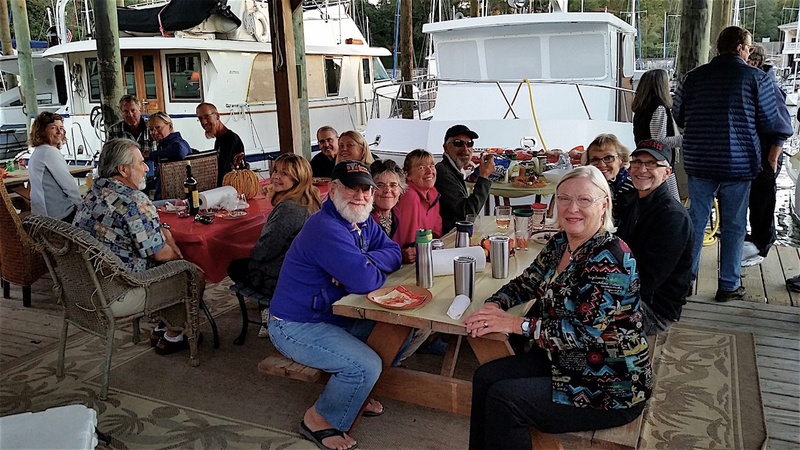 About 30 people were there and we enjoyed conversation with other boaters who in their past lives included a nuclear engineer and a 4-time country dancing world champion. We retired to a cute Netflix movie, The Christmas Angel. We used the courtesy car to go to Fairhope Calvary Chapel and then napped the afternoon away. By Monday, the days were droning on as we impatiently awaited hearing from Dog River as to when we could get hauled out. Several employees were out sick or had sick family members and they were backed up with work. (Seems Loopers had inundated them.) We learned they were closed Thursday through Sunday for Thanksgiving, which meant if we didn’t get hauled out soon, we were facing another week in Mobile! Not hearing from them by evening, we figured out even if we could get lifted first thing on Tuesday, there would be no way to be done before the end of the week. Aaugh. We wanted to be on our way to Florida. By Tuesday, we knew we would indeed be spending another week in Mobile. Once we resigned ourselves to that, we got busy doing boat tasks of our own. 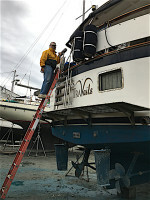 During Thanksgiving week and the days before leaving for Dog River Marina, Paula put another coat of varnish on the handrails (not done for 9 months), began prepping the toerail for painting, scrubbed and removed mildew from several items onboard, and made our own “custom” paint-fleck color to repaint the too-quickly staining main head shower basin. 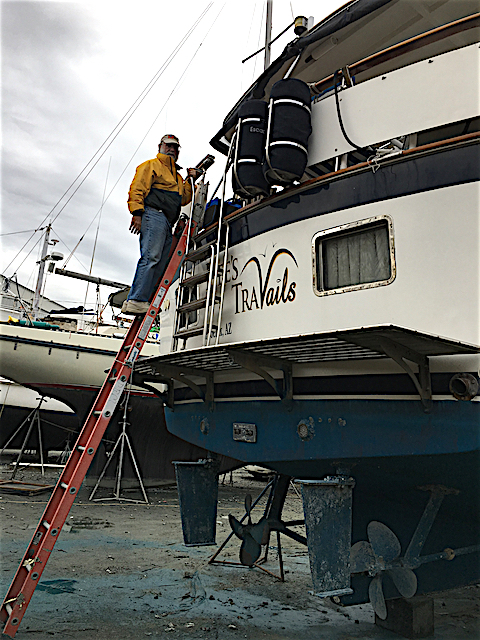 Tom repaired the stern light (as we could not legally do the overnight crossing across the Gulf without it), changed engine oil, steadied our salon table, and resealed the aft teak deck toerail drain. We did a little touring around the cute town of Fairhope, had a great burger at Ben’s BBQ, and watched kite surfers in the whitecaps off Fairhope Beach. We shared Thanksgiving lunch at Cracker Barrel with 7 other boaters…not our best Thanksgiving meal ever, but nice to have good conversation and fellowship. On Sunday, we attended 3 Circle Church’s early service and enjoyed it. We also found a new-to-us Netflix series, Heartland, about a 16-year-old girl who rescued and rehabilitated abused horses. It was a very well written series (of 7 seasons!) and we amused ourselves at night enjoying it. 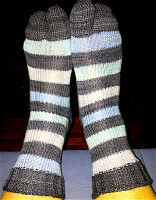 Paula knitted another pair of socks for Tom as she watched, and named them Tom’s “Heartland socks” as they were done almost exclusively while watching the series. 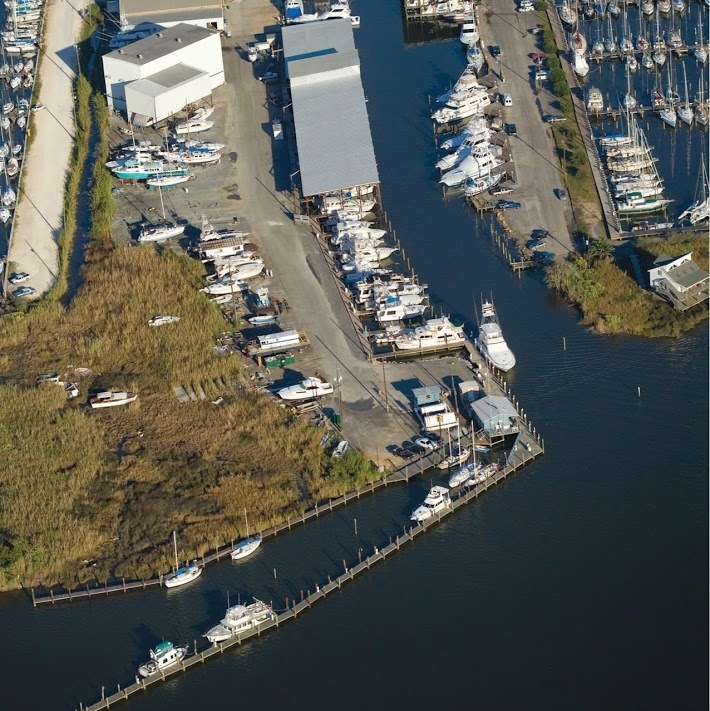 When asked about Life’s TraVails home port, our answer was always “Nowhere.” Since leaving our purchasing port of Gulfport, MS, we had basically been on the move. Sitting for 2 weeks in Mobile with short days and long nights got us thinking about what it would be like living on LT without moving so frequently. In a way, at Eastern Shore, Paula thought it felt even more like “home,” doing “everyday stuff” without always planning our next move…and it felt comfortable. 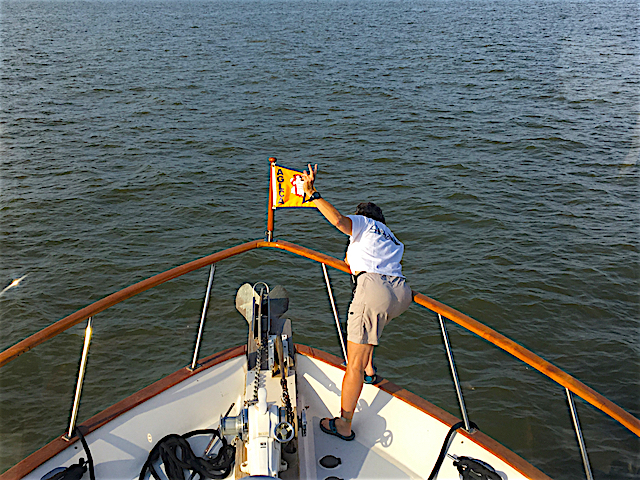 Finally, with a projected haulout of Thursday, Dec 1, we moved Life’s TraVails across Mobile Bay on Tuesday morning with 15 knots before the wind rose higher. Dog River was not going to charge us dockage as we waited, a bonus. (Keeping up the record, we saw dolphins as we crossed the bay!) We parked on the face dock with 3 other Gold Loop boats and by afternoon, had an invitation for docktails from Gold Loopers Andy and Cathy Robinson on Dream Fever. Scott (a retired American 777 pilot) and KC Calkin on Jet Stream who we had originally met at the Trenton Marina in Canada 7 months earlier and Byron and Cindy Miller on Bright Angel, who we had met in Columbus, joined the group too. As the week continued, Tom replaced the engine water pump and a few other items. 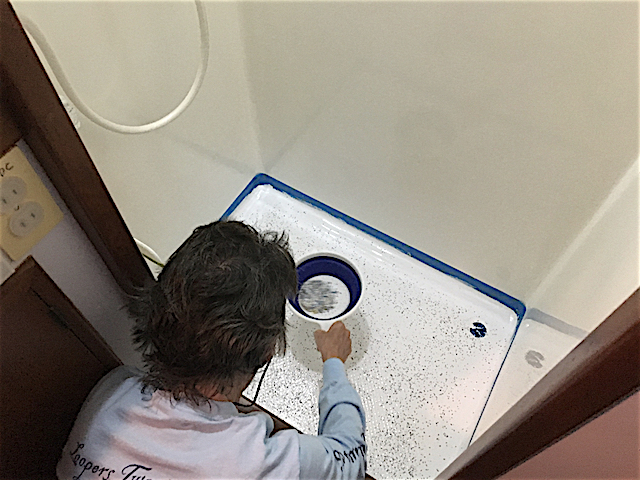 We repainted the aft head shower basin, sprinkling paint flecks in the wet paint to camouflage dirt. We systematically went over the whole boat again to make a list of any repairs and changes we wanted to make. Fortunately, most of the stuff was already on the list. Unfortunately for Paula, it was round 3 with her itchy scalp…and the rash was winning. Thanks to Susan and Glen Warwick’s help (wonderful employees at Dog River), we got an appointment the next day with their dermatologist in Mobile. Though the doctor could not determine the cause, she did take 2 biopsies (one from Paula’s scalp and the other from her back, leaving behind 2 stitches in each) and threw some more anti-itch prescriptions at it until Paula could see her dermatologist back in Phoenix, an appointment which had already been made. 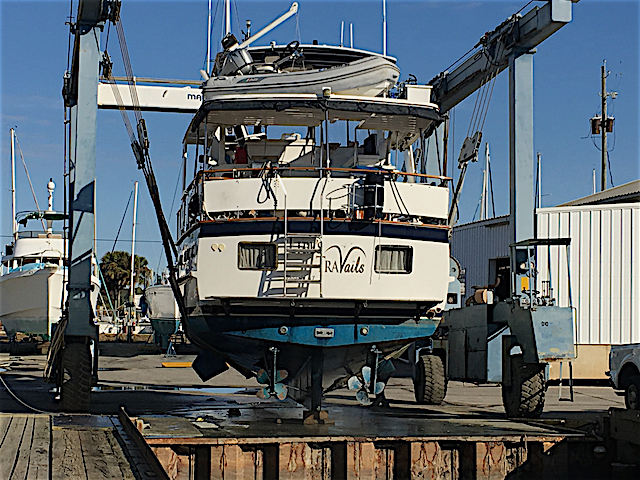 We didn’t get hauled out until Friday, December 2, but the haulout went much better than last time with no damage to the boat. (It’s a bit scary watching your 44,000 pound boat being lifted out of the water on just two 10″ straps, then driven around like a toy.) We figured out we weren’t going to have time for repairs and still make the crossing in Florida before we planned to leave the boat for Christmas in Phoenix. Though very disappointed, we resigned ourselves to staying in Mobile until we returned in late January. 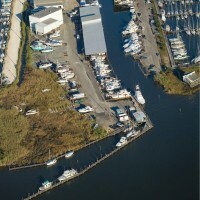 The one positive was dockage is much cheaper in Alabama! After being hauled out, Life’s TraVails was positioned “on the hard” (on blocks on dry land) which then required a ladder to get on the boat. Tom went to work on repairs that could only be done when the boat was out of the water, one of which was repairing the swim step (the only boat damage inflicted by us while trying to dock in very swift current back in Ft. Pierce, FL the previous February). Tom figured out how to rig a fresh water line to our head so we could use it while on the hard, but we would not be able to run water in the sinks, thus no dishwashing or showering (which we did at the marina). It would mean more eating out for a few days. Paula went to Enterprise to take advantage of their $10/day weekend rate. 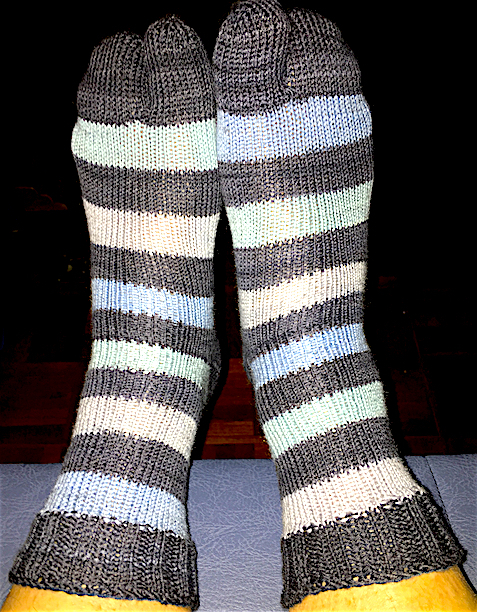 She was out all afternoon running errands (hardware store, AAA, Walmart, West Marine, with a wonderful yarn shop thrown in for good measure). On her return, she saw a bunch of Christmas lights along the freeway, and after dinner, took Tom back for “date night.” It was a wonderful drive-through light show, called Christmas Night of Lights, set up in a stadium parking lot. 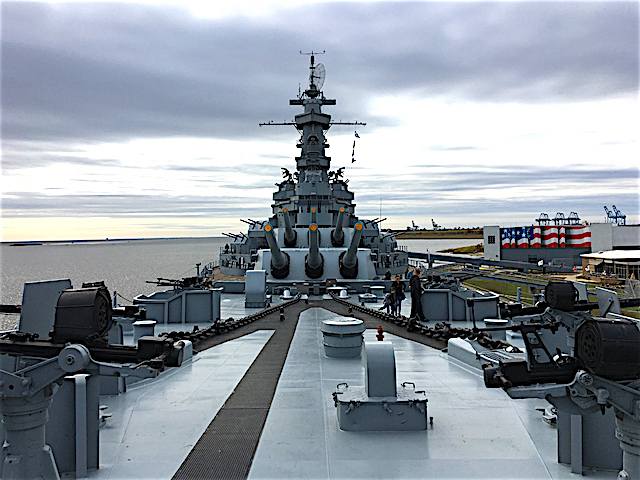 With rain and thunderstorms forecast for Sunday and Monday, we decided to take advantage of Saturday’s better weather to visit the USS Alabama battleship and the USS Drum submarine at USS Alabama Battleship Memorial Park. (Enroute, we found a wonderful breakfast house, Cream and Sugar with delicious ham and egg bagels and croissants, and even better scones!) We spent over 4 hours touring the ships and aircraft displays at the park. The tours were very well laid out and we got to walk and climb all over the various parts of the ships. With a crew of 2500 men, you can imagine the USS Alabama was very large – 680’ long with 108’ beam! 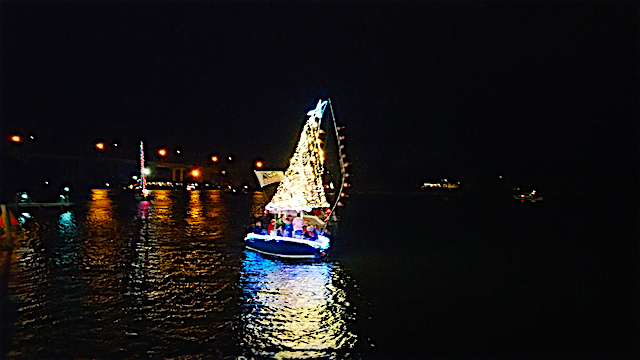 After pizza for supper, we returned to the marina just in time to see the 40th Annual Dog River Christmas Boat Parade, with its decorated boats motoring by on the water as we watched from the dock. The next week dragged by with bad weather – either rain, thunderstorms (even the possibility of a tornado) or wind and cold. It prevented outside work on the boat some days, and even when it was clear, it was too cold to prep the toerail for paint. 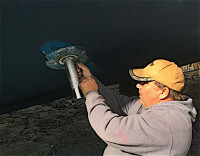 Eventually, the marina was able to paint the bottom, check the prop alignment, remove the props and replace the stabilizer seals. Tom fixed bilge and sump pumps (and hurt his knee doing so), designed and made 2 sets of PVC bumper boards, repaired the swim step and ladder, removed the sea chest top and designed an extension, drilled dinghy tow holes, organized engine room parts, replaced the sea chest grate, sealed a leak in the V-berth, installed galley latches, adjusted the flybridge compass, fixed the port triangular window leak and icemaker leak. Paula worked on route files, did some more boat inventorying, boat cleaning, etc. We stayed busy! We got hooked on the Heartland series and passed the evenings that way. Space heaters borrowed from the marina were used to keep the temperatures inside the boat comfortable, even through one night the outside temperature was 33. All in all, it was a frustrating week, mainly due to the weather and inconvenience of being on the hard but especially after realizing Life’s TraVails was not going to get back in the water before we left for Christmas. 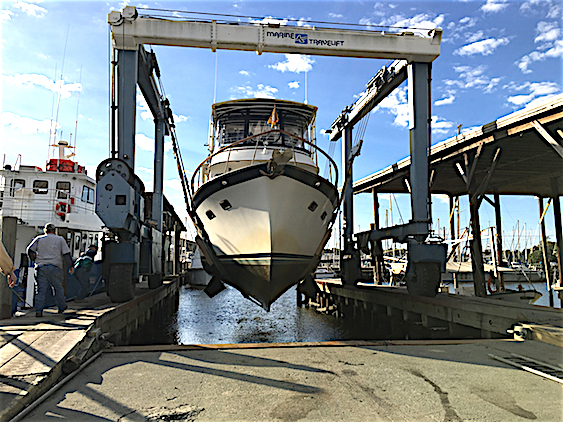 We prepped the boat for our departure, packed our bags, and left LT sitting high and dry until our return in late January. At 5:30 AM, Sunny, the marina owner, picked us up right next to the boat and drove us the to the airport. Now that was service! 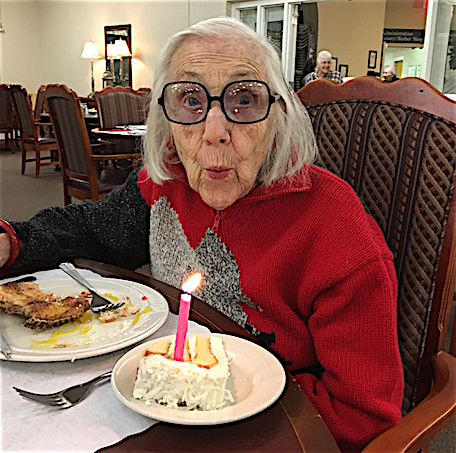 We were blessed to stop in North Carolina for Paula’s mom’s 96th birthday before returning to Phoenix for Christmas.